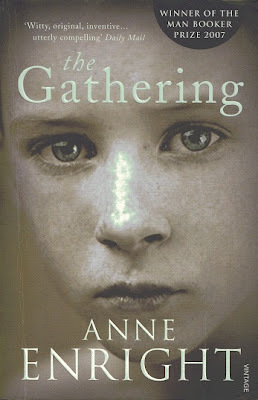 The Gathering by Anne Enright. Ah, bejaysus. It's not all Guinness and hurling over in Ireland, you know - there's a dark side to all the blarney, as this earlier entry in this list made clear, or at least I think it did, but then again I may not have had the faintest idea what the feck it was all about. Arse biscuits! Anyway, the Hegarty clan are from Ireland, and as befits a bunch of reproductively incontinent Catholics, they have brought twelve children into the world. It could have been worse, mind you - old mother Hegarty had seven miscarriages as well. Old pa Hegarty evidently wouldn't leave her alone, the dirty fecker. So when Liam Hegarty kills himself by filling his trouser pockets with rocks and walking off Brighton beach into the sea, his sister Veronica is left with the task of rounding up the remaining siblings for the funeral. As with a few other books in this series (the last two for starters, not to mention here, here, here and here) this establishing of the narrative in some nominal "present" is just to provide a structure to dive off into much assorted flashbackery - Veronica's currently troubled marriage to husband Tom, wistful reminiscences of her youthful relationship with American student Michael Weiss, childhood memories of the various siblings (Liam in particular) and some lurid speculation about the nature of her grandmother Ada's relationship with her husband Charlie and their landlord Lambert Nugent. It eventually becomes clear that Veronica's obsessive interest in this is because of her witnessing an incident of sexual abuse involving Nugent and Liam, in Ada's house, back when Liam was about nine years old. We are invited to conclude that it was this incident (and perhaps others like it, who knows) that sowed the seed that led to Liam topping himself thirty-odd years later; Veronica certainly seems to think so, anyway. So we emerge back into the "present" to find the siblings gathering for the funeral, and a predictably motley bunch they are too: one priest, one successful businessman, one secret alcoholic, that sort of thing. After the wake when Mammy has been packed off to bed they crack into the booze and reminisce about old times - the expectation that something similar will happen after the funeral proper, however, is derailed somewhat by the unexpected arrival of one of Liam's old girlfriends and her son. Liam's son, also, it turns out. And so the wheel of life comes full circle, yadda yadda yadda. While this is a great deal more linear and less opaque than Winterwood, it does suffer from being one of those books that doesn't contain a single character you can really like, or even care much about. Presumably Veronica is meant to be that person, but she's almost comically glum and joyless about everything, which makes it difficult. Liam, the golden boy of everyone's reminiscences, doesn't feature enough, even in flashback, for us to learn anything much about him except that he was a fairly cruel womaniser. And it seems that we're expected to swallow the implication that the abuse at the hands of Lamb Nugent was the reason for Liam's suicide without much compelling evidence being offered - I mean, fair enough, it may have been, but we want to avoid assuming causation where there isn't any, don't we? And the family drinkathon after the wake, which we assume is going to lead to truths being discussed and old wounds reopened, all that sort of thing, peters out without any of that after Veronica buggers off home early. The Gathering won the Man Booker Prize in 2007 (making it the third Booker winner in this list after G. and Hotel Du Lac from 1972 and 1984 respectively) - the prizegiving blurb describes it as "exhilaratingly bleak" - well, I'd agree with the second half of that. I mean, it's fine, but.....hard to engage with, let's say. The one bit that's presumably meant to be uplifting, when Liam's son Rowan is wheeled out at the end, strikes a bit of a false note of tacked-on resolution after all the unremitting grimness that's preceded it. If it's a recommendation you're after here then what I would suggest you do is read Colm Tóibín's The Blackwater Lightship, which shares many of The Gathering's themes - female narrator, wayward brother, family gathering, Irish setting - but which is, for want of a better word, better. Living entirely on a diet of sponge fingers and Tizer, the electric halibut is an elusive, enigmatic creature. Who knows where he will pop up next? He may be coming to your town.....no, hang on, that was the Monkees.